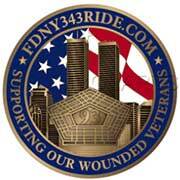 FDNY Challenge Coin now available! A challenge coin is a small coin or medallion bearing an organization’s insignia or emblem and carried by the organization’s members. Traditionally, they are given to prove membership when challenged and to enhance morale. In addition, they are also collected by service members. In practice, challenge coins are normally presented by unit commanders in recognition of special achievement by a member of the unit. They are also exchanged in recognition of visits to an organization. The challenge coin is 1.5 inches diameter by 1/8th inch. Its beautiful design shows the NYC skyline with Twin Towers, Flight 93, Pentagon and flag of the USA on one side, and Never Forget FDNY shield and commemorations on the other.